hat do those unpleasant little bumps on the skin called hives have to do with the martial arts? 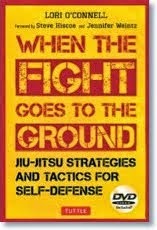 Acupuncturists often use the same points we use during self defense to calm down and eliminate hives. 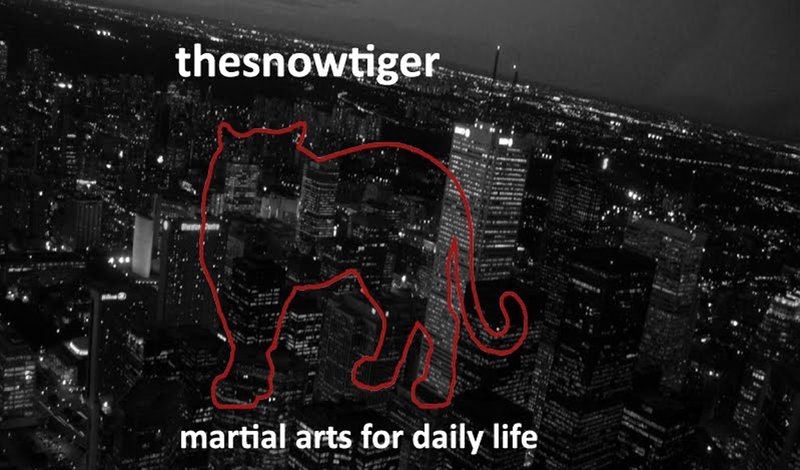 A feeble attempt at humour here…so if we strike or grab a mugger who has a case of hives on pressure point Li 11, we may get away with our wallet, and he may stumble off in momentary pain but healed of his hives. DESCRIPTION – red bumps, or groups of bumps, on the skin that may or may not make you itch or feel like that portion of the skin is burning. Usually, they come on suddenly. CAUSES – Often the cause is an allergic reaction. The body produces histamine as an immune response to a pathogen sending extra blood with white cells and proteins into small capillaries in the body thereby also causing swelling and irritation. The source of these allergic reactions are wide – foods, medications, external stimulants, etc. Hives can also be caused by cold, heat, sweat and the like. Usually, hives disappear by themselves or with the help of antihistamine medication. Serious problems do arise, however, if swelling occurs in the throat and nose, and you experience difficulty breathing. If outbreaks occur frequently, consult with a medical practitioner. If you have difficulty breathing or swallowing, seek medical help immediately. The three pressure points listed here are for very mild irritations only. 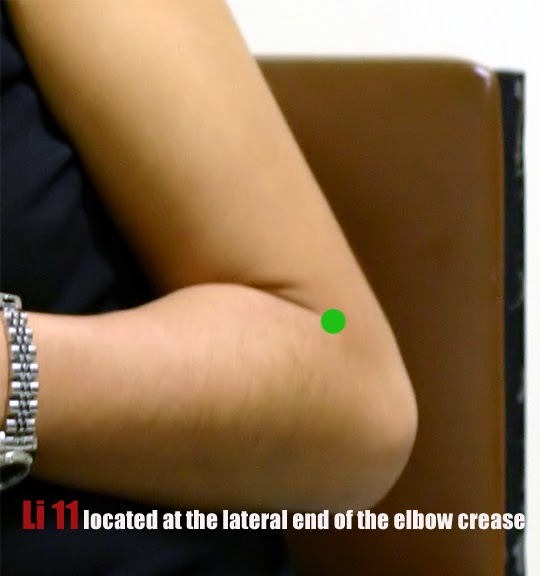 Li 11 – Its location is on the lateral side of the elbow crease on both arms when the elbow is bent. Press gently and breathe slowly. 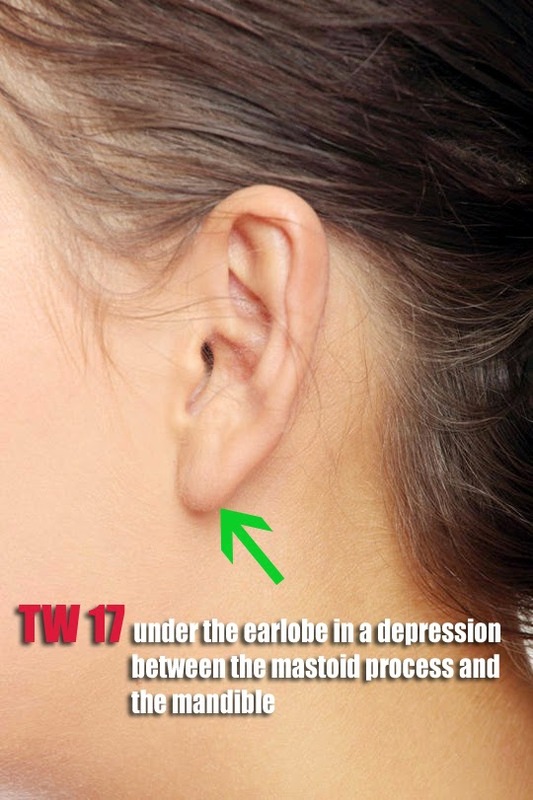 TW 17 – You’ll find this point under the earlobe in a depression between the mastoid process and the mandible. Press gently. You can combine this point with SI 17 which is located just behind the angle of the mandible on the posterior border of the sternocleidomastoid muscle. Press both at the same time under both ears with your index and middle fingers. 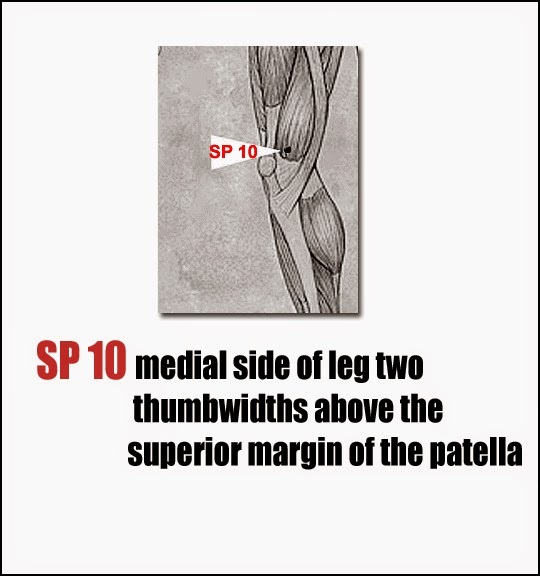 SP 10 – On the inside of both legs two thumb widths above the superior margin of the patella where the quadriceps muscle bulges out. Please remember that points along the twelve acupuncture meridians are located on both sides of the body. So Li 11, for example, on the outside end of the elbow crease of the left arm is located on the outside crease of the right arm as well.